I found some really great home made screens at a garage sale last month. They hadn't been painted or stained. I gave them two coats of vinegar & steel wool stain to darken them up a bit. The recipe for the vinegar and steel wood stain is all over Pinterest. Next I taped around the screen with blue painters tape to I wouldn't slop paint on the screens. I then painted the wood frame with Annie Sloan Chalk Paint in French Linen. I distressed it and waxed it. 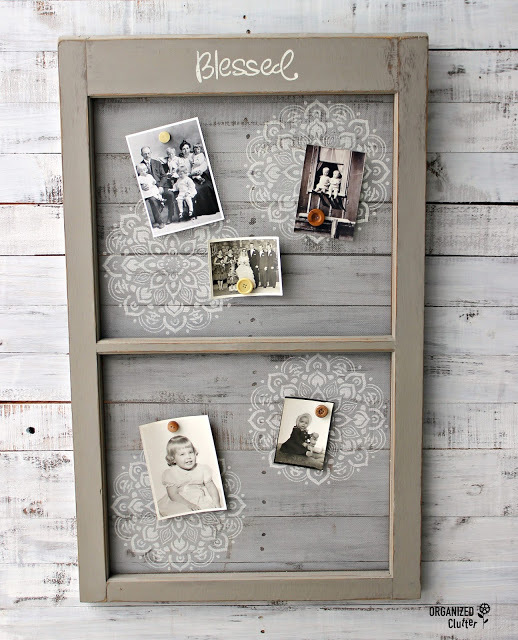 I taped a doily stencil on the frame and started stenciling with light ivory craft paint, but the lines of the stencil were too fine for painting on a screen. I washed it off before it got dry. I also used a little Krud Kutter spray that works pretty well to get paint off that hasn't cured yet. 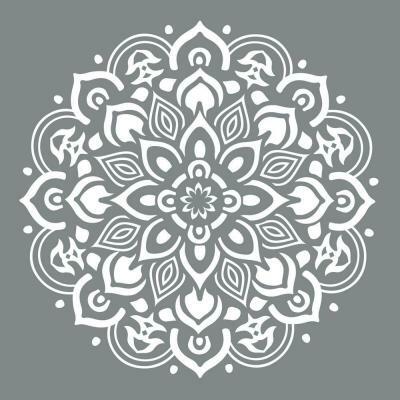 I ended up using a Decoart Mandala Stencil. It was smaller but has a bolder design that worked with my screen. I stenciled two doilies on each screen section. Since the screens were made of metal and not the new synthetics, magnets worked to hold my photos. 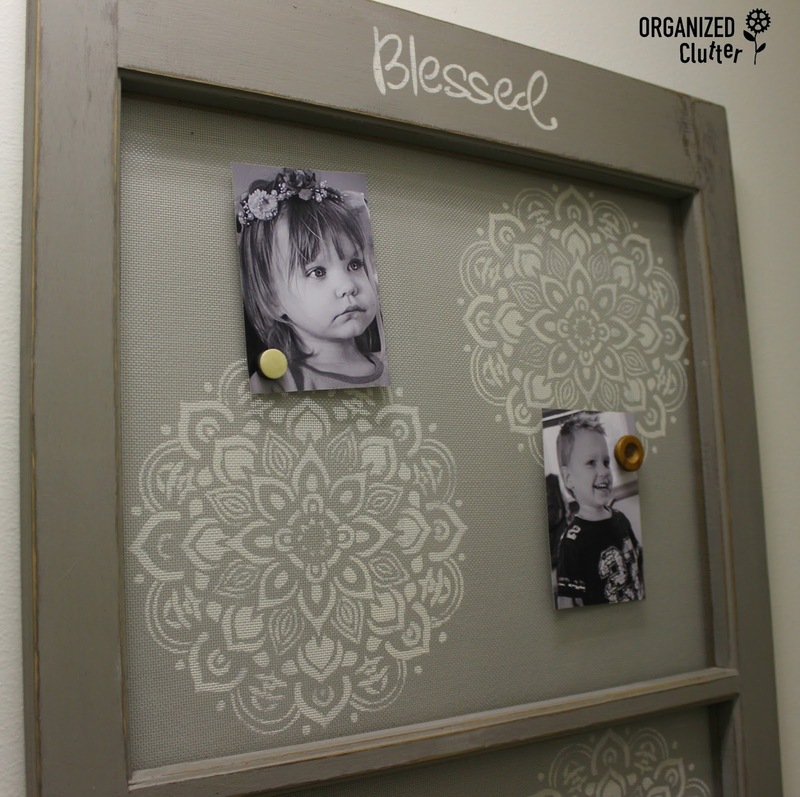 I used the Momenta Adhesive Stencil "Blessed" at the top. I hot glued old buttons onto magnets to hold the photos. As you can see I have room to add more photos. Do you remember this hallway gallery wall that is a work in progress? It's not for everyone, but I am having fun with it! 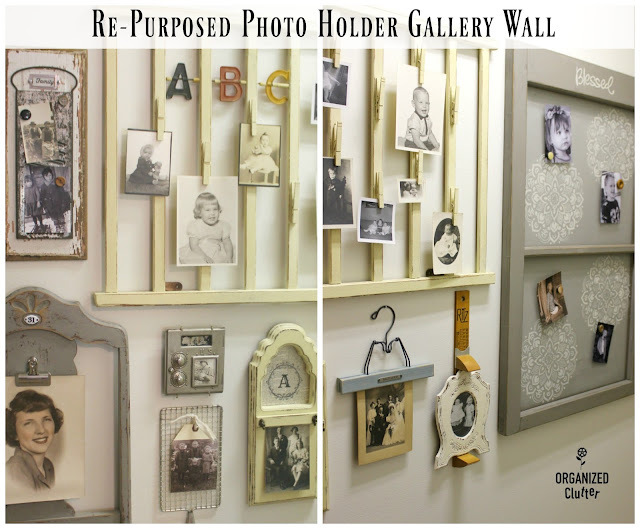 Here are links to all of my photo gallery wall projects. I love how your creative brain works . . . like you say, your wall may not be for everyone, but I Love It! I love your wall! The screen is wonderful! You are so creative!!! I love your unique photo wall! Very creative and truly on of a kind! Who would think to stencil on a screen! Very creative I like that color too! I like that other one with the clothes pins, looks like it may have come from an old crib? LOVE it, Carlene! This is the most interesting photo wall I've ever seen! your gallery wall is UH-MAAAAAZING!!!! Love it! 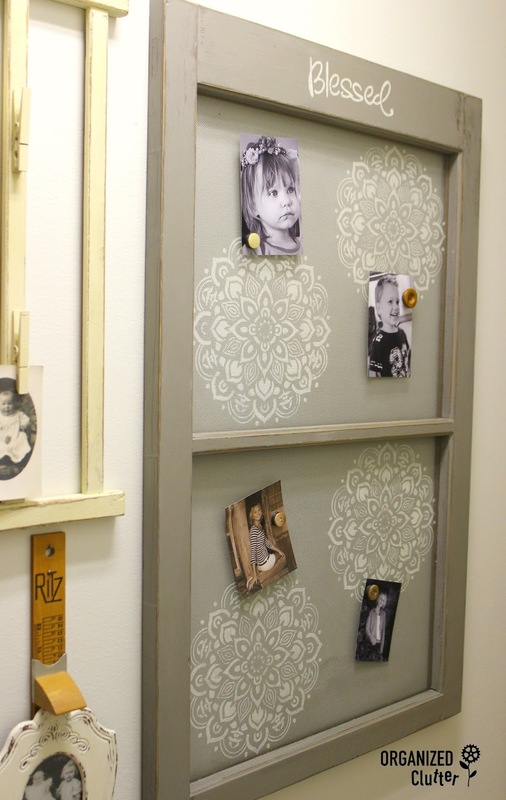 Some many ways to display photos! 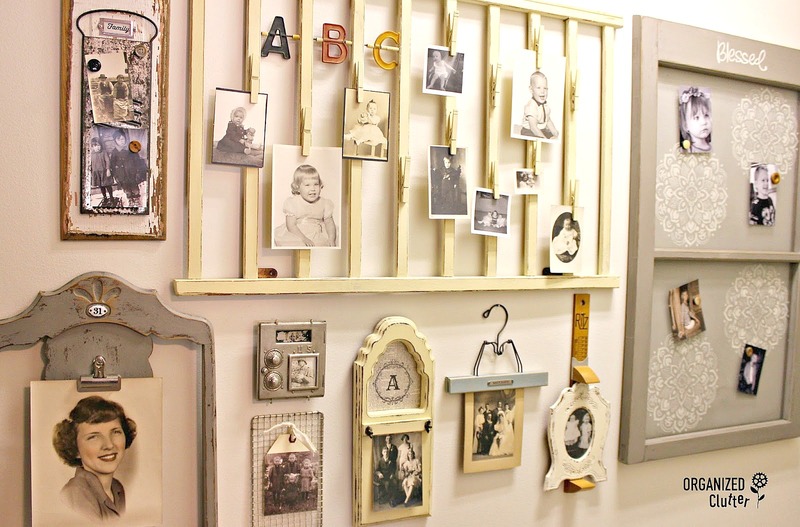 i love all these ideas and love seeing this wall space morph to gorgeous! 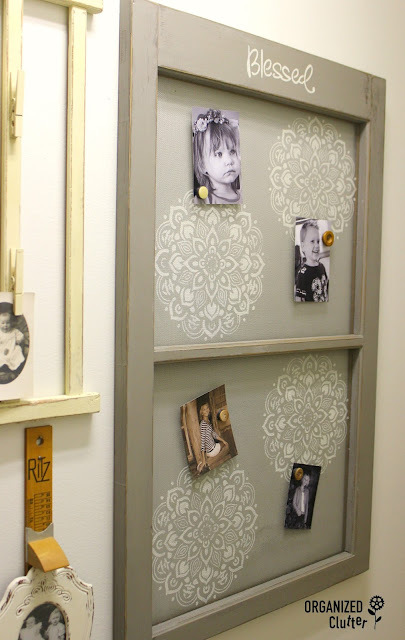 Perfect frame DIY! Genius! I love it!